The work in this gallery is sub-divided into monotypes and limited edition prints, which include lithographs and linocut. 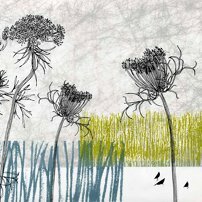 All of the works here are original hand-made prints, created using various printmaking processes. There is often confusion about the use of the term 'print' however because it can also be used to refer to a mechanical reproduction or copy of an artist's work. The following descriptions describe the hand processes I have used to create the work shown here. 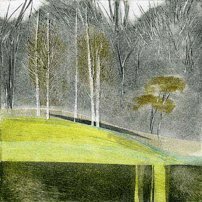 Often described as monoprints, monotypes are unique, one-off original artworks. The image is created by applying inks to a plate (metal in my own case), using rollers, brushes and other mark making tools. The resulting image is then transferred to paper with or without the use of a press and most frequently results in the printing of a single print. This flexible and often experimental printmaking process lends itself beautifully to either a painterly approach or graphic drawing, a technique used to great effect by both Picasso and Matisse. The lithographs here are made using photosensitive lithographic plates. The image/s are exposed onto the plates by means of ultraviolet light and a chemical developing process which then reveals the image on the plate, from which the print is made. Each plate represents a separate colour or layer and the final image can be printed in a number of layers. Unlike monotype however, the image remains on the plate and a number of prints can be made, ie. creating an edition of prints. This is a relief printing process - the image is created by cutting into the lino, removing either the negative or positive space.The surface of the lino that remains will be the printable surface of the plate when inked up using a roller. This is also a process with which it is possible to print a number of copies. This is another relief printing process I am occasionally using, sometimes combining it with monotype. It involves cutting into Japanese plywood, again removing either the negative or positive space. The resulting plates are printed by applying watercolour with Japanese brushes and hand printing onto Japanese papers / tissue, using a bamboo barren. The resulting image has a beautiful, translucent quality because of the materials used and the tools employed remain unchanged for centuries and have a beautiful traditional and timeless quality about them.